A new method of identifying human gnaw marks on bones suggest early humans got nutrition from each other's flesh. Human gnawing and chewing marks have been identified on human and other hominid bones. The findings support the idea that some prehistoric humans practiced nutritional cannibalism. The newly identified signature for human bone chewing is also helping to determine what animals early hominids ate. 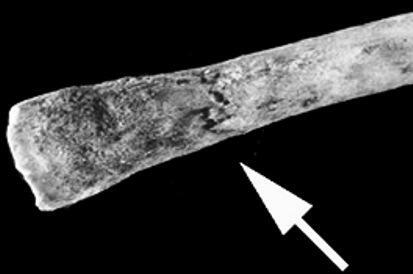 A rib bone is shown with damage left behind after a European experimenter chewed on the bone using back teeth. Prehistoric humans, along with Neanderthals and Homo antecessor, made meals of each other, suggests new research on probable human teeth marks found on prehistoric human bones. The findings, which will be published in the January issue of The Journal of Human Evolution, support prior theories that the first humans to re-colonize Britain after the last ice age practiced nutritional cannibalism 12,000 years ago at a site called Gough's Cave in what is now Somerset, England. It was a survival strategy, according to authors Yolanda Fernandez-Jalvo and Peter Andrews. "Think that a member of your group dies," Fernandez-Jalvo told Discovery News. "The body can give one day off from hunting, which was always dangerous at that time, and what to do with the dead body that may attract other dangerous carnivores that may attack the group." "This could be a good solution," she added, reminding that cannibalism does not always mean the cannibal killed the consumed individual. To determine what patterns humans leave behind when they chew or gnaw on bones, the researchers had four different groups of European people chew raw and cooked meat bones from various animals. The scientists also studied bones, now in a museum, which were chewed in the 1960's by the Koi people of Namibia. The Koi tended not to cook food as much as the Europeans did, so the researchers wanted to see what kind of damage they left behind on discarded bones. The scientists also analyzed fossilized bone collections from ancient hominid sites in Spain, the U.K. and the Caucasus region. They determined that when humans chew and gnaw bones, a distinctive pattern is left behind. It includes bent ends of bones, puncture marks, superficial linear marks, peeling, crenulated ends and double arch punctures on the chewed edge. Not all of these features are unique to human chewing, but in combination, the researchers believe the features provide evidence for human eating. Since bone chewing usually occurs when the consumer is trying to get at marrow and the last bit of meat, the marks can help to distinguish nutritional cannibalism from ritual de-fleshing. The findings can also reveal which animals prehistoric humans and human ancestors ate. "Indications of Homo habilis eating hedgehog and using tools to eat them" has already been identified, Fernandez-Jalvo said. She also said evidence suggests Neanderthals consumed marine mammals shortly after these animals gave birth, "chasing the youngest as an easy and clever strategy and avoiding the adults that were quite dangerous." There is also evidence for an older man in China using stones to bang down on meat so it would be easier to chew. Charles Egeland, an assistant professor of anthropology at the University of North Carolina at Greensboro, told Discovery News that "distinguishing human chewing damage from other agents (carnivores, non-human primates, non-biological processes) is extremely important." "One of the more interesting implications of this study -- and there are many -- is that we may now have a useful set of criteria to identify meat-eating among early, pre-stone tool-using, hominids," he said. "Somewhat ironically, this then raises the question of whether modern human chewing damage is actually the best analog for these early hominids," Egeland added. "Would chimpanzee chewing damage make a better analog?"